There is a direct relationship between the pattern of lifestyle households lead and energy consumption and emission. Modern civilizations are run by energy. Considering the rising demand for energy, it’s important to study the way people build houses to find out ways to identify and reduce the unnecessary use of energy. Unless governments set examples and encourage people to achieve a sustainable lifestyle, it will be difficult to help people materialize sustainable living. Heating and cooling are the major components when it comes to the overall energy consumption of a house. The efficiency of a house depends largely on its ability to control heat loss, the movement of moisture, and air leakage. Preventing air and moisture from penetrating into the interior of a home is a basic design requirement. 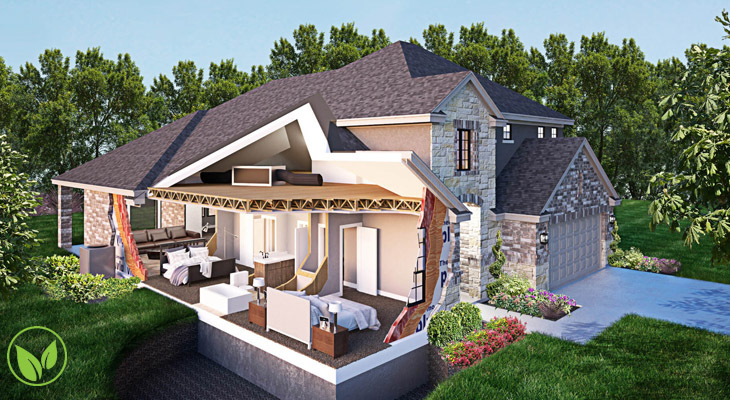 When it comes to eliminating thermal bridges, airtightness of a home plays a key role. Growth of mildew and mold rarely takes place in the presence of strong moisture resistance home. Continuous insulation and moisture barriers are inseparable parts of energy-efficient home design. As mentioned earlier, heating and cooling systems account for almost half of a home’s energy use. Therefore, it’s important to pay due attention when purchasing heating and cooling systems. For instance, an efficient HVAC system must be more than 90% efficient, which means there is a minimum amount of energy loss. Building new houses in accordance with the Energy Star recommendations can help you build an energy-efficient home that will help you reduce your utility bills in the future. Appliances and electronic products also play a vital role in reducing a home’s energy use. Don’t use an outdated, inefficient microwave, dehumidifier, freezer, washer or dryer if you want to design an energy-efficient home. If you’re in Edmonton, contact Nor-Can Heating & Air to learn more about energy-efficient homes, heating, and cooling solutions. Apart from our HVAC repair and consultation services, we also help households install energy-efficient appliances and get instant rebates on buying some energy-efficient products such as tankless water heaters. Contact us for more information!